Britain has some of the best medieval castles in the world. Some are surprisingly still intact and lived in whilst others just have ruins left - a shadow of their former, glorious selves. If you live in or come to visit Britain and have an interest in medieval history, then it's your lucky day because there are hundreds of medieval sites open to the public. Medieval castles in Wales include Coch Castle, Denbigh Castle and Caernarfon Castle. Medieval castles in Scotland include Castle of Mey, Hermitage Castle, Caerlaverock Castle. Many British medieval castles are on or near to the coast. Take, for example, Dunstanburgh Castle and Bamburgh Castle in Northumberland. Both are on the coast yet one is in ruins whilst the other intact and still lived in. Both of them command some of the most spectacular locations you could ever imagine for a medieval castle. Tourist accommodation in this area is plentiful and if you want a vacation rental (self catering) cottage that's extra special, there are some luxury Northumbrian cottages on hand to make your stay even more enjoyable. Moving further north you are soon in Scotland, a country famous for its history including medieval history with the likes of William Wallace. Now there's a medieval folk hero worth talking and writing about - but that's for another time and another post! Alnwick is a small and very characterful town in Northumberland not far from the coast of North East England. It is perhaps most famous for its medieval castle but well worth a visit in its own right. Of particular interest to fans of maritime history (as is the case with my family) is the White Swan Hotel, a 300 year old coaching inn. It has one of the most interesting and attractive dining rooms I’ve ever seen, being furnished with original fixtures and fittings from the RMS Olympic, sister to the RMS Titanic. When you walk into the room it’s like walking into the past; the carved, oak panelling, mirrors and stained glass windows leap out at you as if from James Cameron’s award-winning movie (for which I understand a research team was actually sent to the hotel to make detailed studies because the Olympic’s fittings were identical to those on the Titanic). I’m digressing here from the point of this article (sorry!) but if you ever go to Alnwick, don’t forget the White Swan Hotel! My family and I visited Alnwick recently; we had been to the town before but on that occasion there wasn’t sufficient time to visit the castle, so this time we were determined not to miss it. It was a week day and therefore should have been quiet in terms of visitors but no, it was really busy! 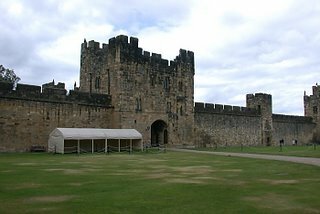 Since being featured in the Harry Potter film series, Alnwick Castle has attracted thousands of visitors from all over the world. As we walked into the inner part of the castle, my son and I, having read all the Harry Potter books and seen all the movies, immediately recognised the Hogwart’s lawn from where Harry launched himself on his first broomstick flight (see photo). Having got over that bit of excitement we then went on an excellent, guided tour and heard about the thrilling history of the castle, its key architectural features and points of defence. The earliest parts of the castle were built by Yves de Vescy the Baron of Alnwick in 1096, just 30 years after the Battle of Hastings. If it helps put the age of this magnificent castle into perspective, we’re talking about a generation before the birth of Ghengis Khan! My family and I have visited a lot of castles over the years and we all agreed that Alnwick Castle has a very strong, ‘individual’ air about it; its architecture and layout and the carved stone figures set randomly on top of the high walls all give it a unique character and one can easily see why moviemakers favour the place. As one of 4 ‘medieval’ enthusiasts, I’m delighted to welcome you to the Blog of medieval-castle.com. Our website has been in existence for a number of years and we are committed to developing it to its full potential with ever more information, photographs and special features such as our haunted castles and fantasy castles sections. Medieval history offers many different things worthy of study – from castle design to the many aspects of medieval life, warfare and weaponry through to the medieval crusades and then on to medieval literature, medieval music and medicine. The list is almost endless! One thing that makes medieval study really exciting is that we are privileged to be able to see tangible evidence from that era – suits of armour, medieval art, medieval weapons and of course the castles themselves, though often only ruins. 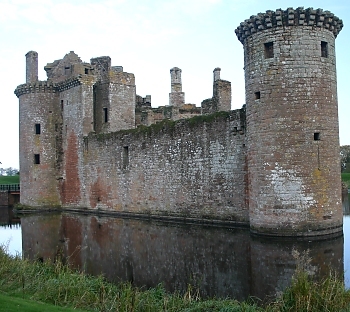 Photo: Caerlaverock Castle - the kind of moated medieval castle that gets medieval enthusiasts excited! I recently made a trip with my family to the Northumberland coast and saw several amazing medieval castles – Alnwick Castle, Bamburgh Castle, Dunstanburgh Castle and Warkworth Castle. The last 3 are reputed to be seriously haunted so it was just as well that we visited them during daylight! Possibly the most intruiging thing that emerged from the trip was that each castle was very different from the others - in design, architectural features, location and even atmosphere. So much so that I can’t cover them in this one article so I plan to write about each experience separately. The first one is going to be Alnwick Castle, a truly breathtaking place to visit.